The first known Schoolhouse in Brentsville was a one room building close to The Hatcher Memorial Baptist Church at the corner of Bristoe and Hooe Streets. The Church was built in 1847. The Brentsville School was known as Brentsville District School #1 from 1871—1944. The first teacher was P.G. Slaughter, he was paid $50 a month. Mr. R.H. Stewart August 1880. Miss. Ida Nicol 1887, remained at Brentsville for several years. Miss. Ella Garth was the next teacher and in 1908 was over worked and an assistant was hired. Miss. Garth was paid $30 a month and her assistant was paid $25 a month. In 1893 The Brentsville Courthouse was no longer needed because the County Seat was moved to Manassas along with the Courthouse. Then the Brentsville Courthouse became The Prince William Academy, a private school until 1905. In September of 1907, it was offered to the Brentsville District School Board for use as a public school. The sale price was $800 but the matter was tabled and no futher action was taken for two years. Then in 1910, the Board reopened negotiations to purchase the old Courthouse and two acres of surrounding land. An agreement was reached with Dr. W.J. Bell to buy the building, the land and all slates, desks and other equipment for $900. The plan was to remodel it into a two room school. When the remodelling plans were submitted to the State Board of education, however, they were rejected because the first floor ceiling in the old Courthouse was too low. Plans were redrawn and on July 13, 1912, the Board agreed to architect I. A. Cannon’s plan to remodel the Courthouse by removing the upper floor and putting in a false ceiling, higher than the original one but eliminating the second floor. The lower floor would then be divided into the two rooms the School Board felt were necessary. The Board agreed to pay $900 for both the old Courthouse and the two acres. In August of that summer, the Board agreed to erect a solid board fence between the newly converted Courthouse and the old jail Building. In 1919, the Board agreed to appropriate $150 for a metal ceiling and to recruit citizens to do the work. Two teachers continued to handle grades 1—7 at the Brentsville School. In 1921 a group of citizens petitioned the School Board for a high school and the Board did hire a third teacher to provide high school subjects for the students who desired them. Between 1923 to 1925, Mr. George W. Beahm, a well known educator who had most recently taught at the Woodlawn School, was principal teacher at Brentsville. The first white schoolhouse at Brentsville was moved in 1914 for a cost of $15, to the newly acquired site for the Brentsville Colored School It served the black children of the community for another four years. The rest of the faculty during that time consisted of Miss Shields and Miss Naomi C. Pearson. Miss Pearson stayed on at Brentsville after Mr. Beahm left and filed the 1925—26 year end report. Then in 1926, Anne Ross Keys came from Greenwich to teach reading, writing, arithmetic and geography to the lower grades. She was twenty two years old, and a high school graduate. In 1928, the District Board agreed to build a new schoolhouse to serve the white children of Brentsville. The Courthouse by that time, was over one hundred years old and in need of replacement. The new High school in Nokesville had been built and the older Brentsville students were bused there. 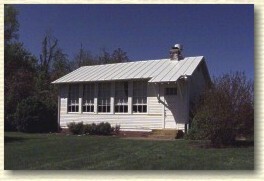 The new building was a one room school with a white weatherboard exterior. The building had five large sash windows, as well as a door on the front to let in light. The floors were narrow tongue—and—groove maple and the ceiling was made of pressed tin. Hanging lamps provided light on dark days and black—boards lined two walls. Coats, lunch pails and the wash bucket were kept in the cloatroom by the front door. The gable roof was metal covered. The new teacher was— Lucy Mae Motley. The next teacher was Miss Dorothy Woodhouse, through April 1938. Then, Miss Mary Buckley, through April 1941. From Superintendent of Schools Richard Haydon’s report at the end of the 1933—34 school year, we know that the enrollment at the Brentsville School stood at thirty nine with an average daily attendance of twenty nine. There were twenty three promotions that year, eight failures and eight drop outs. The next fall, thirty pupils were endrolled and an average of nearly twenty nine attented on a daily basis. At that time, first through fifth grades were housed at Brentsville. The sixth graders were bused to The Woodlawn School, and the seventh grade students went to Nokesville. The seating capacity of the schoolhouse was forthy five, but attendance during its lifetime generally ranged from twenty to thirty pupils. Until 1941, first through fifth grades were taught at the Brentsville School. That year, only grades 1—4 were housed there. The teacher was — Miss Mary Senseny, who had attended Cannon Branch, Bennett Elemetary and Manassas District before going off to college to earn her teaching degree. She returned to Prince William County to begin a long career as a teacher, Brentsville being her first assignment. She was paid $80 per month that first year, and $85 the second year. From that salary, Mary paid Mr. and Mrs. Seymour $25 a month for room and board during the week. She went home to Manassas on weekends. The Seymours also boarded two children in their house and the teacher and pupils walked a mile each way to school. On really bad days, Mrs. Seymour would drive the two children to school. By the 1940s, people had become more aware of the importance of sanitation. Each child in Mary’s classroom had his or her own cup for drinking just as each had his own clean basin of water in which to wash hands before lunch. Water came from the school’s own well via a pump in the front yard. Mary had to sweep the schoolroom floor herself but Mr. James (Cookie) Wolfe made the fire in the coal stove every morning in the winter. After her marriage, Mary, now Mrs. Kline, lived in Manassas and drove to Brentsville to teach each day. As is the case with most teachers, she found the second year easier. There was only one fifth grader that next year, and he was allowed to go to Nokesville. The next year, Mary went to teach at Nokesville Elementary School and later moved to Baldwin elementary in Manassas. She had a teaching career which covered more than twenty—five years. Mrs. Wilma Tomlinson and then, at the end of the 1943—44 school year, the school closed and the children were bused to Nokesville and Manassas.